Welcome to Affordable Awnings Company, where you can get high-quality, custom awnings at very affordable prices near Newport Beach, Newport Coast. We manufacture and install awnings and other shade structures, including fixed awnings, retractable awnings, carports, patio covers, cabanas, outdoor curtains, sail shades, drop rolls, sunscreens, and canopies, for both homes and businesses. Combined, our staff has accrued more than 75 years of experience in the awning industry and use that experience to provide Newport Beach, Newport Coast clients with unbeatable custom awning design, fabrication, installation, and recovering services. At Affordable Awnings Company, you can rest assured that you'll get beautiful, long-lasting awnings and other shade structures at the best value. Our awnings, canopies, and patio covers are always fully customized to the needs, preferences and budget of our clients, and can be built in any size, shape, or design. Everything we install is manufactured at our nearby warehouse by our dedicated, in-house awning experts, who only use materials of the highest quality, from powder-coated aluminum frames to stylish Sunbrella fabrics. Due to the great care we put into every job, we are happy to stand behind everything we do with a written guarantee. Whether you are looking to reduce your cooling costs, expand your outdoor living space, or enhance the exterior of your home or business, Affordable Awnings Company is here to help. Our team of shade specialists are readily available to provide free consultations and estimates to anyone in our Newport Beach, Newport Coast service area. Affordable Awnings Company is a factory-direct awning manufacturer that has been dedicated to serving the needs of those in and around Newport Beach, Newport Coast for over a decade. 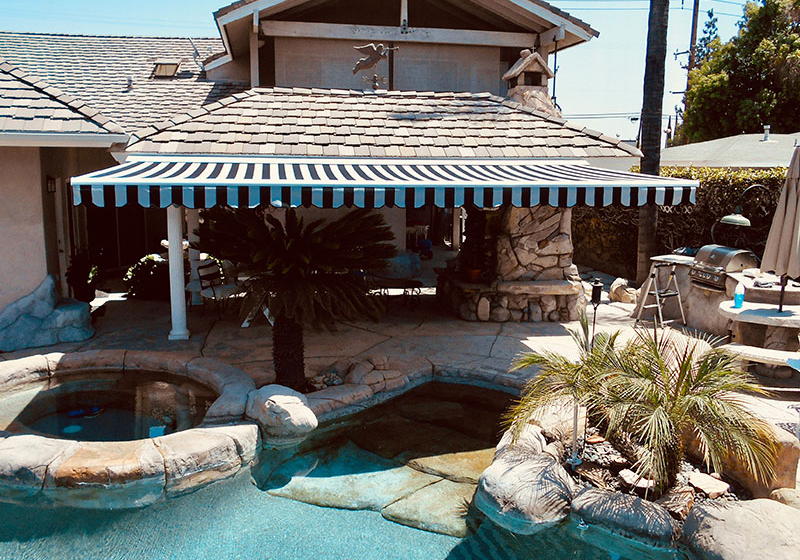 We have thousands of satisfied clients throughout Southern California and an impeccable track record of producing awnings on time, within budget, and to the complete satisfaction of our residential and commercial customers. We maintain an A+ rating with the Better Business Bureau and continuously receive positive reviews and testimonials from our many clients. For over a decade, Affordable Awnings Company has provided customers in Newport Beach, Newport Coast with residential and commercial fixed awnings customized to their specific needs. We manufacture all of our fixed/stationary awnings in house with superior quality materials, such as powder-coated steel frames, extra durable threads, and Sunbrella outdoor awning fabrics. Choose from a wide range of shapes (rounded, convex, dome, concave, and traditional), over 140 colors, and 12 valance styles. Our awning specialists can install fixed awnings over doors, windows, patios, decks, and other spaces of any width. 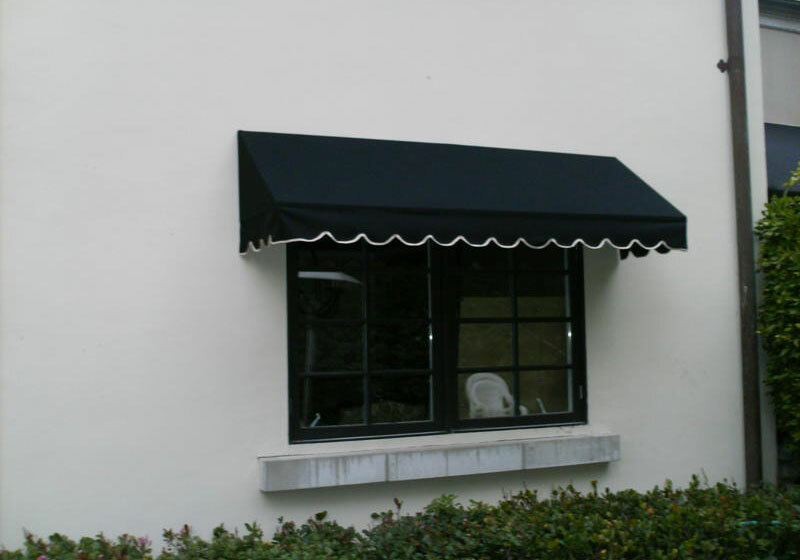 Speak with a Newport Beach, Newport Coast fixed awning specialist today and receive a free consultation and estimate. Retractable awnings give Newport Beach, Newport Coast residential and commercial clients the ability to extend their awnings on sunny and rainy days and retract it on low visibility or temperate days. They come in both manual (cranks and pulleys) and motorized models (with or without environmental sensors)--both easy to operate, very quiet, and backed by 5-year warranties. Like all our awnings, retractable awnings can be completely customized to suit your needs, design preferences, and budget. Retractable awnings are made with long-lasting, attractive Sunbrella fabrics and powder-coated, low-maintenance aluminum frames. They can be manufactured to span any width and project out to 13 feet. Call today for a free quote; our experienced professionals will assist you every step of the way so you get the perfect retractable awning to complement your Newport Beach, Newport Coast property. At Affordable Awnings Company, we design, manufacture and install gorgeous, long-lasting window awnings for residential and commercial clients in the Newport Beach, Newport Coast area. Our custom window awnings are affordably priced and highly effective at reducing heat transfer and glare, thus minimizing cooling costs. By working with our awning experts, your window awnings will be crafted to perfectly complement your Newport Beach, Newport Coast property. We use fade- and water-resistant Sunbrella fabrics which are backed by 10-year warranties, and powder-coated aluminum or extra durable steel for our frames. Production is always done quickly without sacrificing quality, and installation can be completed in as little as one day. To learn more and to get a free quote, call us today. At Affordable Awnings Company we give Newport Beach, Newport Coast clients access to high quality, long-lasting custom aluminum window awnings made by skilled professionals. Ideal for homes and businesses in Newport Beach, Newport Coast looking for durable, maintenance-free shade solutions, each aluminum window awning is specially made to your exact specifications within a short timeframe and backed by a limited lifetime warranty. Your Newport Beach, Newport Coast aluminum window awning can come in a wide array of coordinating colors and fixed-frame styles perfectly suited to windows or all sizes. We offer complimentary design services to guide you through the awning process. Call today for a free estimate.. Affordable Awnings Company is the premier choice for custom-made and expertly installed carports in Newport Beach, Newport Coast. For the last decade, we have produced functional, sophisticated, and durable aluminum and fabric carports at very affordable prices. Carports are ideal for protecting cars from the daily wear and tear of harsh weather, as well as make it convenient to load and unload your car on rainy days. As an added bonus, because carports are not fully enclosed, they are not considered living quarters, which means they don't usually require permits to install and are much more affordable than a new garage. To learn more and to get a free quote, call Affordable Awnings Company today. Aluminum wood patio covers are a great investment for Newport Beach, Newport Coast residential and commercial customers. They have a timeless, sophisticated wood finish appearance; a highly durable surface that repels stains, oil, dirt and dust; and a cost-effective price. Aluminum wood patio covers can be affixed to the side of any building or freestanding—either way, we'll design and custom-build it to perfectly complement your property. We offer a variety of colors, shade structure styles and rafter cuts to choose from. Call today to talk with one of our aluminum wood patio cover experts. Quotes are free. At Affordable Awnings Company, we provide Newport Beach, Newport Coast home and business owners with high-quality, maintenance-free custom metal aluminum patio covers at cost-effective prices. Our fully licensed specialists will help you design an aluminum patio covers that is stylish, functional, and within your budget. Our aluminum patio covers are built to withstand the harshest weather conditions and come with a lifetime limited warranty. Contact us to obtain a free aluminum patio cover price estimate for your Newport Beach, Newport Coast property today. For over a decade, Affordable Awnings Company has been the trusted source for fabric patio covers in Newport Beach, Newport Coast. From design conception to installation, our patio cover experts will take great care to ensure you are getting the very best care and service. We'll start by providing you with a professional consultation where we can help you determine the best color, size, and shape for your fabric patio cover, and then promptly begin work on its production using the finest craftsmanship and materials. Fabric patio covers are built with steel frames and available in over 140 Sunbrella fabrics. They can also feature one of 12 valance styles. Call today to learn more and get a free quote. Affordable Awnings Company is a fully licensed, bonded and insured factory-direct manufacturer and experienced installer of custom shade sails, also frequently referred to as sail shades, near Newport Beach, Newport Coast. Our visually stunning and highly durable shade sails block 95% of the sun's damaging rays and can lower temperatures by as much as 20 degrees on hot days. We custom design every sail shade to each client's unique needs and only use superior-quality fabrics, threads and posts. Our sail shades give outdoor spaces a unique look without compromising function. 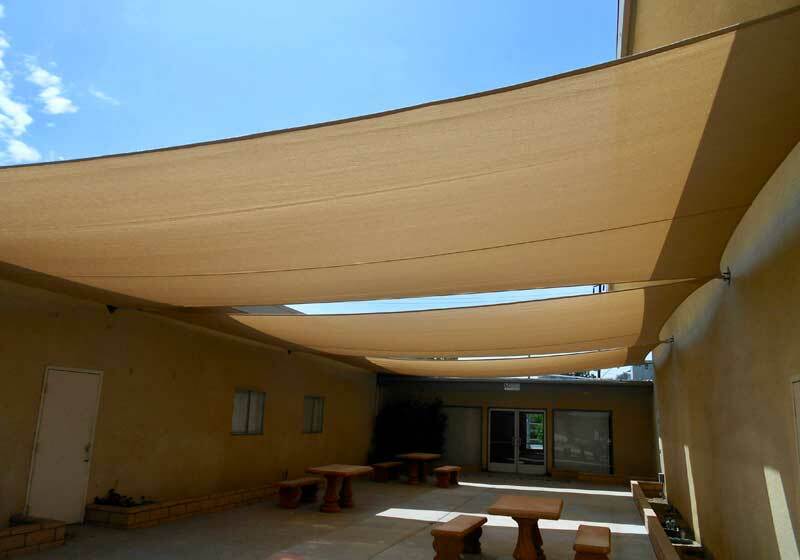 Call one of our shade specialists today to explore all of our shade sail shape, color, style, and fabric options in order to create a long-lasting solution that fits your needs and budget. Estimates are free. 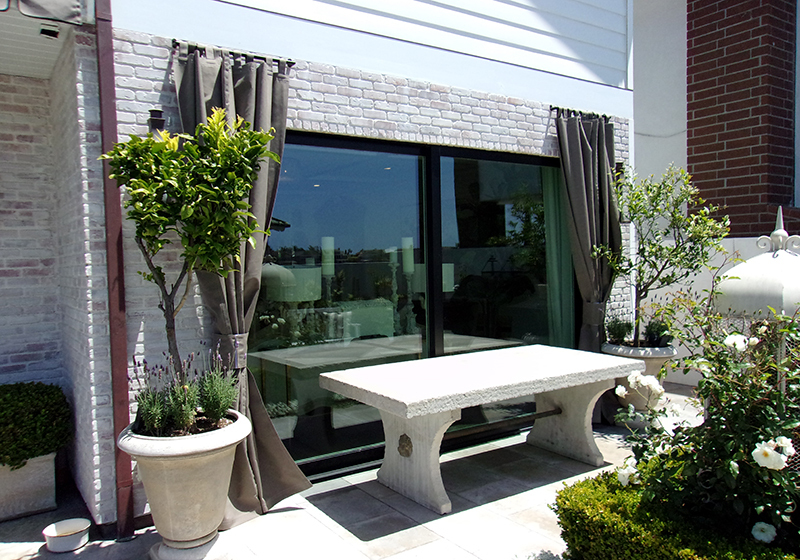 Outdoor curtains are at once attractive, elegant, simple, and highly functional. They can keep your exterior space warmer on cold nights and cooler on hotter days. At Affordable Awnings Company, we manufacturer outdoor curtains that are customized to the needs of our residential and commercial clients in Newport Beach, Newport Coast. We are proud to use the industry's best fabrics, premium threads, and experienced craftsmanship in producing all of our outdoor curtains, while keeping costs low. In customizing your outdoor curtains, you'll have more than 140 weather-resistant fabrics to choose from, all backed by 10-year limited warranties. Call today and speak with one of our experienced outdoor curtain specialists to learn more. We offer fast turnaround times and one-day installations. 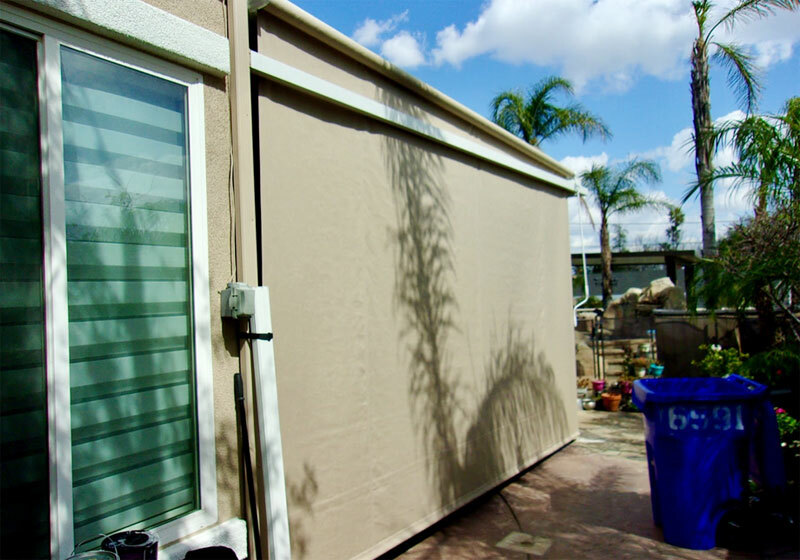 One of the most convenient and versatile shade options we offer is the shade screen, also referred to as a sunscreen or drop roll. Newport Beach, Newport Coast residential and commercial clients alike appreciate their effectiveness in reducing heat transfer and glare and their low cost. Shade screens can be mounted over windows, decks, or patios, and provide added privacy and intimacy without blocking scenic views. In designing your shade screen, you can choose from two types of mesh fabrics (70% mesh and 90% mesh) as well as Sunbrella fabrics which block 100% of the sun's damaging UV rays. With top-quality materials and expert workmanship, our shade screens/sunscreens/drop rolls are built to withstand years of use and are backed by a written guarantee. Talk to a Newport Beach, Newport Coast shade specialist today. Expand your outdoor living space with custom-made outdoor cabanas by Affordable Awnings Company. Outdoor cabanas can create a spa-like experience in a home's backyard in the middle of Newport Beach, Newport Coast or private and intimate spaces that are perfect for guests of commercial resorts, spas, hotels, and outdoor bars. Affordable Awnings Company's team of shade experts will help you create the luxurious and durable cabanas you envision for your property at an affordable price. Our cabanas feature powder-coated steel frames and decorative Sunbrella fabrics. Sunbrella fabrics come with a 10-year warranty and are available in over 140 colors, patterns and stripes. We can even add curtains for privacy and decorative valances. Call today to get a free quote and consultation for your custom cabana in Newport Beach, Newport Coast. Did you know that an awning's steel or aluminum frame can outlast its fabric by as much as 15 years? You can take advantage of this fact if your existing fabric awnings are looking worn or old, or have tears in them. At Affordable Awnings Company, we specialize in recovering fixed and retractable awnings using high-quality Sunbrella fabrics for Newport Beach, Newport Coast businesses and homes. We have more than 25 years of experience recovering and repairing awnings, and can rejuvenate your awnings for half the cost of a completely new awning installation. If you want to explore if an awning repair or recover is right for you, call us today to schedule your free assessment and estimate. As a full-service awning contractor, Affordable Awnings Company can also apply custom graphics to any fixed or retractable fabric awning. Using extensively practiced techniques, our staff produce high-quality, vivid logos, lettering, and other graphics that are easy to comprehend from the street. Our custom graphic services are so high quality that they are sure to last the life of the awning without any peeling or flaking. 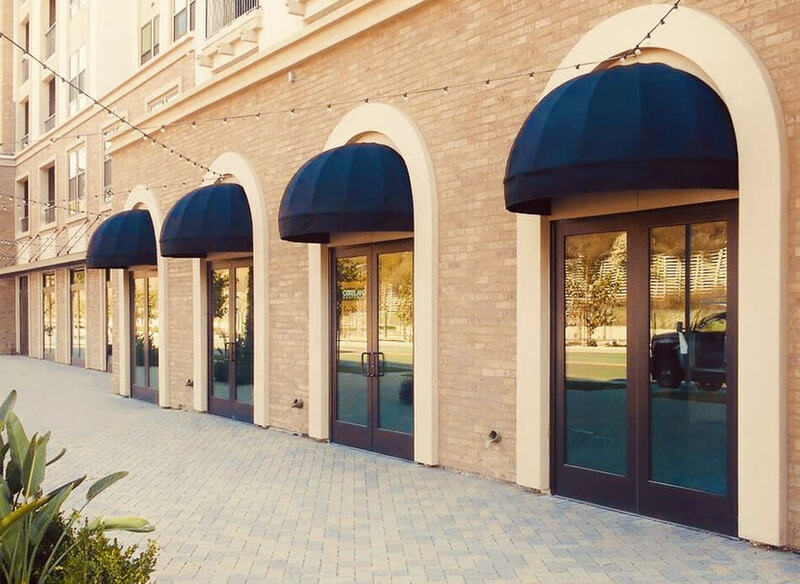 Because we have over two decades of experience and the ability to produce exceptional results at very competitive rates, we are the premier choice among businesses in Newport Beach, Newport Coast looking for long-lasting storefront awnings with custom graphics. Call us today for a free quote.